Ok I admit it, there is no Professor TEGEF, it is just a little memory jogger. These six simple rules , picked up from others, have helped me feel comfortable when face-to-face networking (with the ultimate long-term goal of generating leads). If you find yourself in a similar situation, I hope there might be something in here for you. T – Two Ears One Mouth : Use them in that proportion. You’ll want to get your own message heard, however, by listening more than talking, you understand the other persons, objectives, ideas and passions. Then you’ll get a feeling for which themes to pursue, and how to “frame” your words so they make maximum sense to the other person. G – Get THEIR Business Card : I think it’s possible to be obsessed about business cards as in this great scene from the film American Psycho. The most important thing by far is NOT to hand out your card, it is to get the OTHER persons. You then have the ability to follow up. If they don’t have one, write their email address on the back of one of yours. S – Secondary Network – Even if you have no obvious shared agenda with the other person, always bear in mind that you may be able to hook each other up with OTHER members of your mutual network. I think karma will ultimately reign. See more about the secondary network here. Here is a real example, with names changed to protect the innocent. I identified Hugo (via Linked-In) , who I thought would be an ideal customer. It transpired that Hugo was a Level-2, and that he and I both knew Ted. I emailed Ted, and, cutting a long story short, Ted put me in touch with Hugo who eventually became a valued customer. Had I tried to contact Hugo directly, I would have had no chance, as he is already maxed out with un-solicited approaches. The “numbers” are interesting. British anthropologist Robin Dunbar, thinks the limit to the number of people with whom we can maintain stable social relationships is roughly 150. 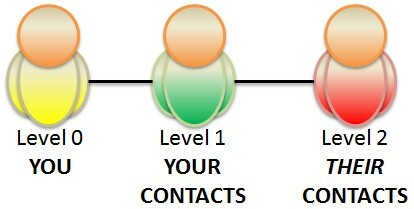 Lets (conservatively) estimate that we have, on average, 100 Level-1 contacts. 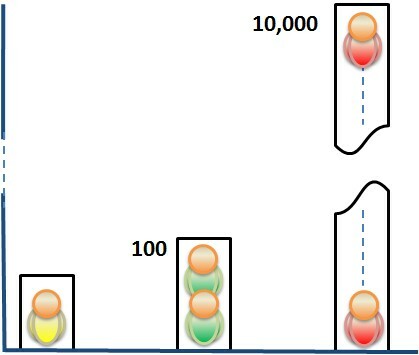 That puts the number of Level-2’s at ten thousand (100 x 100). If you are looking for people who buy oak furniture, turbo-charge fork-lifts, or make decisions on IT spend, the chances are there are some in that Level-2 community. 1) Online : By ensuring that your on-line content has the ability to be shared you effectively allow the people who read it, to advocate it to their Level-1’s (your Level-2’s), which can potentially exponentially increase your exposure. 2) Face to Face : When you next find yourself at a networking event, relax, even if the none of the other people attending look like prospects, some of them could well connect you to prospects. One of earliest references to “Not what you know…” was actually said by a Film Director, Mike Cross: “In Hollywood, it’s not what you know but who you know,” adding that the awards ceremony was the perfect place to make connections. I’m a simple northern lad, so my equivalent of an awards ceremony is probably a breakfast networking event. At the last one I attended I chatted to a nice lady next to the coffee and biscuits. I will probably never be her ideal client, but it’s quite possible that I know someone who could be.